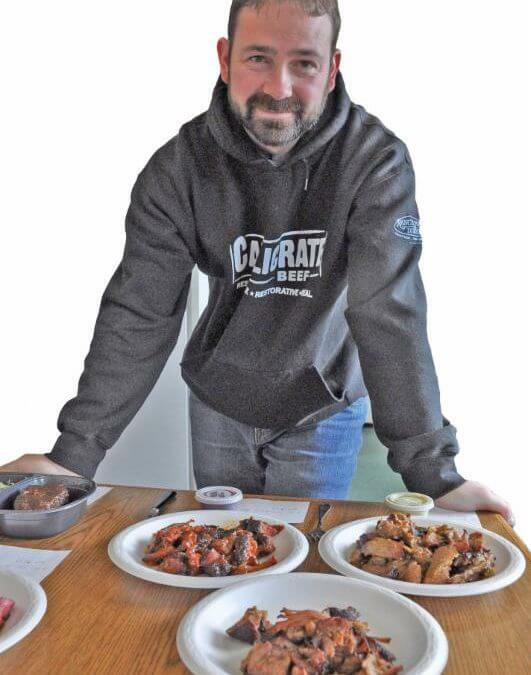 Chef Aaron Miller joined the Ranch Foods Direct team this fall, charged with creating a new line of delicious heat-and-eat prepared items and hot soups made with Callicrate meats. Here’s more about him. WHAT INSPIRED YOUR LIFE IN FOOD? I was 14 when I decided I wanted to be a pastry chef; then, in my late teens, I decided I should learn everything I could about food, because I didn’t want to pigeonhole myself. My mother was a baker; my godmother was also a baker, and my aunt was a baker and caterer, so I grew up around food. It fascinated me. I never questioned what my career path would be. My mother was a librarian and one of the absolute smartest people I’ve ever met. She read at least four full-length novels a week. She passed all of the tests to be on Jeopardy, although her name was never drawn. She was also a great baker; she knew how to make the world’s best pie crust! Nobody knows how she did it, and she passed on before she got around to teaching me. It was the day after my 20th birthday; she knew my career was coming, but didn’t get to see all the cool stuff I did. HOMETOWN: I grew up in Lancaster County in Pennsylvania. It’s the land of milk and honey. It’s one of few places where you can grow anything because the soil is so rich. The farmers markets and seasonal produce influenced me a lot. It’s a real cultural melting pot too. PREVIOUS EXPERIENCE: Believe it or not, I worked in 18 different restaurants by the time I was 28. I got my first executive chef gig when I was 26. Then I became a professional brewer for awhile with Dogfish Head Brewing, the 15th largest craft brewery in the U.S. I was into privately owned, local and seasonal places before it was cool. In my mind, that’s just the way things should be. WHY RANCH FOODS DIRECT? Quality ingredients mean the utmost to me, and that’s why I wanted to work for Ranch Foods Direct. It’s very much my dream job. I get to be creative and work with incredible products. When my wife (Ashley) and I decided to move out here to be close to my in-laws, I was already familiar with the company. They are Ranch Foods Direct devotees! I knew this was a company where I could fit in and feel passionate about what I was doing. FOOD FAVES: The “bavette” is my new favorite steak. It comes off the flank. I was aware of it, but had never had it. It’s a loosely grained meat, similar to skirt steak or London broil, really super tender and really flavorful. And this might sound funny, but I’m really passionate about soup! Great dishes are built on layers of flavor, and soup is a really good example of that. THANKSGIVING IS COMING UP. DO YOU PUT ANY UNIQUE TWISTS ON YOUR THANKSGIVING DINNER? I’m a sucker for tradition. I love Thanksgiving just the way it is, but I do embellish a little bit. For example, I brine my turkey for almost a week in apple cider and buttermilk. I get a little funky with it but I do all the typical sides… stuffing and succotash and I always do a butternut or pumpkin soup, maybe both if I’m feeling frisky. And I always make a pumpkin pie AND an apple pie and eat some of both!